News that the city Department of Transportation (DOT) is considering a plan to install bollards and tree beds around the Atlantic Yards arena site--plans that cut the "effective width" of nearby sidewalks, likely causing event-related bottlenecks--came as a surprise to the two Brooklyn Community Boards, CB 2 and CB 6, that might comment on such a plan within their jurisdictions. That's because of a skein of errors and, I'd contend, obfuscation by developer Forest City Ratner. The DOT, fed somewhat misleading information by the developer, last month sent plans to Community Board 8, the only one of the three project-affected Community Boards that does not have jurisdiction over the arena block. Nor did CB 8 did forward the plans to its neighbors. As shown in the map below, the dark blue lines indicate CB boundaries, and the light blue box indicates the approximate location of the arena, west of Sixth Avenue. The arena plaza, also the site of bollards, extends to the triangle just west of the arena within CB 2; though shown on this map, Fifth Avenue has already been demapped. Robert Perris, District Manager of Community Board 2, said the board's Land Use Committee typically considers such applications and may make a comment. "I've reached out to my Chair," he said yesterday, indicating that, given that the deadline to comment (as first noted in Atlantic Yards Watch) to the DOT is Thursday, August 25, the board might ask for the deadline to be extended. "It was not our mistake," he said, that they learned about it so late. The bollard plan prepared by Forest City Ratner and presented to the DOT (click on graphic at left to enlarge) did not indicate a Community District, site of a Community Board. In fact, it stated "N.A." That means "Not Applicable," a designation that seems misleading. However, the document should have provided sufficient clues for DOT to select the correct Community District. The site is designated at Block 1118, Lots 1-5. 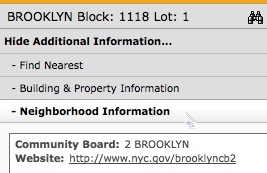 A search on the interactive NYCityMap shows that Block 1118, Lot 1, is located in CB 2, as indicated in the graphic below right. A search on the official arena address, which as provided is 620 Atlantic Avenue, also shows that the property is located in CB 2.